JET Rack - The Industry Standard #1 Selling Sliding Ladder Rack. Welcome to the Official Home of JET RACK® , The #1 Selling Interior Ladder Rack for vans, truck caps, trailers, sheds, and more. 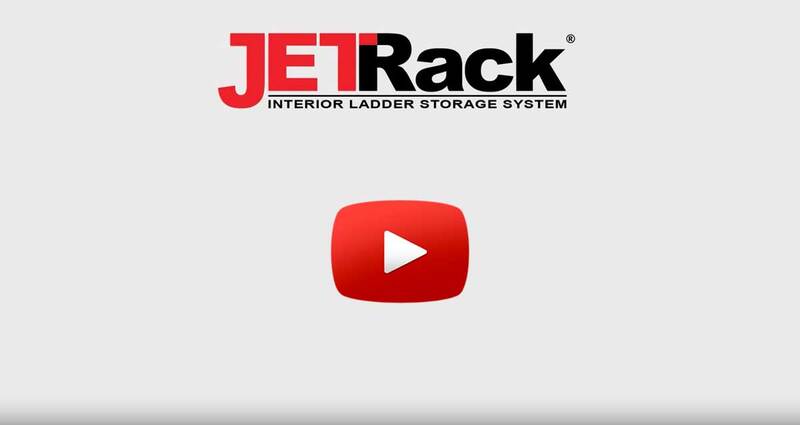 JET Rack® allows you to quickly and easily secure your ladder using the most underused space—the ceiling! JET Rack® creates a more organized storage space, prevents tangling with tools and materials, and eliminates ladder damage caused by constantly shifting cargo. JET RACK® features the most compact design available while remaining fully adjustable to fit the most common types of A-Frame ladders up to 10 feet in length. Combine two JET Racks to create an extension ladder rack and store ladders longer than 10 feet. A top choice for any professional: Electrician, HVAC, Plumber, Carpenter, Handyman, Painter, Maintenance,… really for anyone who uses a ladder, JET RACK® is sure to Save Time, Save Space, and make every day easier. Secure your ladder instantly on ceilings or walls. Protect your ladder from shifting cargo, theft, and damaging weather. Easy to install, Easy to use — no hassling with buckles, straps, or ties. Main components cast using tool-grade aluminum for strength and durability. Conveniently designed to use widely available hanger strut (sold separately). Whoever invented this must be in the business…..only somebody that knows what a pain in the @&$ that is could come up with something like that. I love it! The genius of it is that it uses strut. I have piles of that stuff lying around my shop. I purchased a JET RACK from you guys a few years ago and I’ve had it in my van and then I went to buy a new truck. I had all kinds of racks and shelving in my old truck but out of all that stuff the JET RACK was the only thing I kept to put in the new one. I use it all the time. I want it… Sir wouldn’t you like to see how it works? No, I saw what you just did there, I want it now…who do I see? I have to laugh. This was such a big problem for me do you know what my solution was? I spent TWO DAYS installing a platform using hundreds of pounds of plywood and lumber and it was for one simple reason…so I could keep my ladder inside without it getting in the way and now I see this!? I should have thought of this instead! We have used the JET Rack in our service vans for over ten years and we would be lost without it! My guys beat the hell out of their ladders in their trucks. I see it every day….We have LOT of Trucks it would be crazy NOT to use it! Look at that… it uses Unistrut! [Shaking head]… man that’s a good idea right there!